As you may have seen, I was already before that book a big fan of Guy Kawasaki. And I don´t hide that fact to you. 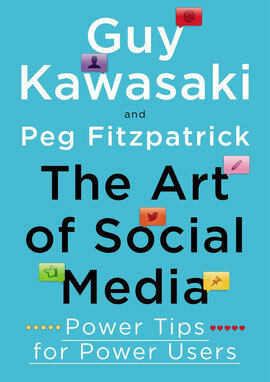 So I am lucky and proud to pre-review “The Art of Social Media” even before its release. I can tell it´s definitely worth reading. As is mentioned in the book, Guy is the writer of the book. While it is coauthored by Peg Fitzpatrick, who is the social media expert of the two, having one writing style, makes it super easy to read. Plus while this is the hundred percent Guy Kawasaki - style, it is clear, concise while full of content. I was a blogging novice at www.sportspunk.de before the “Art of Social Media”. However, after reading it and once I apply the techniques described there, I am convinced to improve the webspace presence of my blog. Of course, I don´t want to recommend the book as black magic. But yes, it is full of tool, tips and techniques that help you to promote your brand (whatever it is) “on the line” (my favorite quote from the movie “Internship”). Already the way this book was promoted, shows the authors know how to use social media. Nowadays books are even before public release brought in anyway to the readers. So they feel included. This is what they have with “The Art of Social Media”. But they describe many more events and promotions they have done. Anyway, this wouldn´t be a true book review without negative points. However, the only thing negative that comes to my mind is, that the book is written by Americans and for Americans. With this I mean that only American sites and tools are mentioned. But this is not a critique on the authers. This is merely a description of the status quo: Most of social media stuff comes from there. So, defintely also a book worth reading for people outside of the US. So if you want to apply the hints of the book onto Europe, you can use the same tools. Additionally, many techniques from the book apply also to other social media channels. In the end: If Europe is using social media in less depth, this is not the fault of the authors. Moreover, I believe this is a chance for you. Because social media is growing in Europe as well. In summary, if you are a social media novice –like me- the book will help you a lot. If you are a social media expert, the book will be helpful as well. I am sure –even as an expert- you don´t know all the techniques and tools Peg and Guy reveal there.